Did you see MyPillow on QVC or while shopping at Walmart and wondering if it really is the perfect pillow for you? We have spent countless hours researching the MyPillow Classic, the Premium and the company itself and put everything we found in this review. We also answer questions if you should get the Classic and Premium version, talk about common complaints and if MyPillow is a scam. An average pillow that comes with a hefty price tag. There are better options out there. 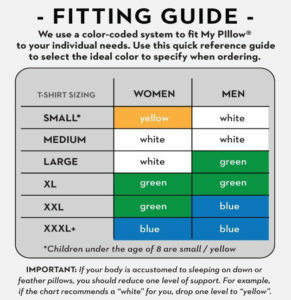 Since MyPillow was founded in 2004 by Michael J. Lindell, it has gained quite some popularity and today you not only find it in various retail stores or on QVC but can also order it on various online stores. Especially their health claims garnered some attention. Sleeping on MyPillow supposedly not only improved overall sleep but could help with insomnia, snoring and even prolong REM sleep. Because of these claims, MyPillow was sued by various California consumer groups. We talk more about this lawsuit a bit further down. We found that back sleepers seem to enjoy this pillow the most while many side sleepers report that it is a bit too soft to support their neck. Since the Premium offers more filling this might be the better option for those who prefer to sleep on the side. For stomach sleepers, it might be a bit too thick. Let’s look at the construction of this USA-made pillow. The pillow comes with a 100% cotton cover which is fairly breathable and should do a good job letting hot air flow away from your head to keep you cool at night. Unfortunately, the cover itself is not removable, meaning there is no zipper to open it or to wash it separately. Since you can wash the whole pillow in your washing machine, this is not a huge problem though. The pillow is filled with, what MyPillow calls, “patented interlocking fill” which turns out to be shredded polyurethane foam pieces in various sizes. The pillow supposedly doesn’t flatten after long use but we have found multiple reports that noticed that the pillow gets quite lumpy after a while. 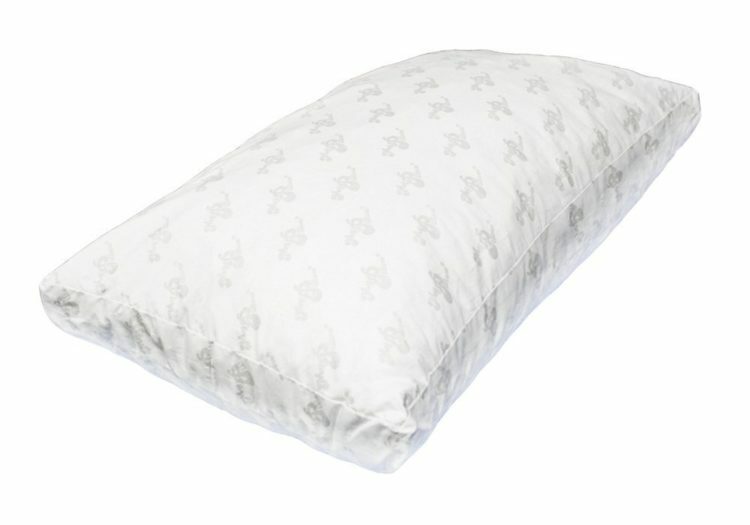 To fluff it up again, MyPillow recommends to wash it often and to put it into the dryer for 15min. This indeed increases the fluffiness of the pillow, which is true for most shredded foam pillows though. The lumpiness can make it a bit harder to adjust the pillow to your preferred sleeping position. Shredded memory foam pillows are usually decent in promoting good airflow and the MyPillow performs ok in dispersing heat away from your body. The pillow might be a bit softer than you are used to but it still provides average support. Like mentioned before, especially back sleepers could be happy with this pillow since they should opt for a medium-firm pillow that is not too thick in order to sufficiently support their neck and spine. The Classic pillow comes with 2 different firmness options (medium and firm) while the Premium comes with 4 options to cater to all sleeping types. With many pillows, you will notice a strong chemical smell after unpacking. While this smell is not dangerous and very common with foam pillows, the MyPillow as no noticeable off-gassing smell – especially after putting it in the dryer for 15min after unpacking. The most common question we get is – should you get a classic or a premium MyPillow? There are actually not that many differences between the Classic and the Premium. They both have the same cover and filling material. The main differences are firmness and thickness. In general, we recommend the Classic for back sleepers and the Premium for side sleepers since it is thicker and can support their head better while sleeping on the side. So if you opt for the Premium you will have more flexibility to adjust the pillow to your individual needs. Due to the increased thickness, the Premium also offers more filling and a slightly different stitching which allows for increased thickness. In early 2017 the BBB (Better Business Bureau) revoked MyPillow’s accreditation and downgraded the company to an F (source). The BBB took this step for various reasons, one being the fact that MyPillow had offered their “2for1” deal, also known as BOGO-deal, for more than half a year in the row. This violates state and national organization rules since a sale that goes on for the majority of the year can’t be called a sale anymore. But it is not only their marketing strategy that caused an uproar amongst dissatisfied customers. On various online platforms, forums and online shops customers unhappy with the pillow’s performance voiced their opinion, leading to many mediocre reviews across the web. 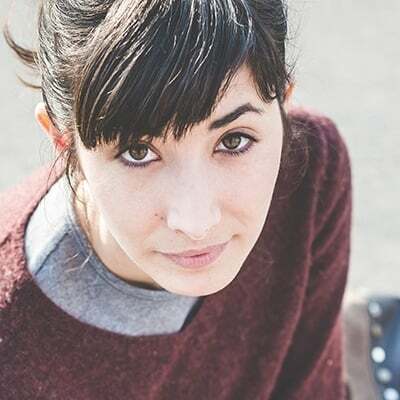 Besides a lack of firmness and a subpar quality for a pillow of this price point, many mentioned that it did not, as advertised, help with their sleep-related problems.In late 2016 the district attorneys of 10 counties filed a lawsuit against MyPillow. MyPillow Controversy & Lawsuit – Is it a Scam? In 2016 an organization called “Truth in Advertising”, short TINA.org, filed a complaint with the Federal Trade Commission to stop MyPillow from using unsubstantiated claims in their marketing campaigns. This lead to the aforementioned lawsuit. In the end, MyPillow settled for “$995,000 in civil penalties and a pledge to give $100,000 to homeless and domestic violence shelters in California.” (source). MyPillow must also stop promoting their pillows as the “official pillow” of the National Sleep Foundation because they failed to disclose their financial ties to the organization to consumers. So, is MyPillow a scam? In our opinion – no. While we disagree with their marketing tactics we also believe that in the end, you get a pillow that does its job alright. But we also believe that there are better pillows on the market, at a lower price. Should you buy the MyPillow? At this point, it must be pretty clear that we can’t say that MyPillow is the best pillow we have ever seen. In our opinion, it is an average, basic, pillow at a very high price. There are better options out there but buying a pillow is also a very individual choice and ultimately only you can decide if you sleep better on MyPillow or another pillow. For those who want to try, you can make use of the 60 day trial on mypillow.com. If you decide to return it you will have to pay for shipping though. MyPillow is an average pillow that does its job but does not excel in any way. There are mixed reports about the longevity of the product and many found it lumpy and offering insufficient neck support. There are however other who really love it, making it very clear how individual preferences for pillows are. We stand by our opinion that there are other pillows out there which provide better value for money. Some even offer organic materials, removable covers or advanced cooling features. If you want to give MyPillow a try, make sure you buy the pillow through this website so you can make use of the 60-day trial. PrevPrevious7 Best Cooling Pillows: What is the best Cool Pillow?